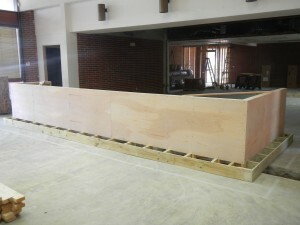 Bar starts to take shape. The base frame of the bar came together this week. The top will be some old picky cypress and the front will be barnyard and oak. http://zbcbeer.com/wp-content/uploads/2015/11/zbc-website-header-logo-500.png 0 0 Robert Hilferding http://zbcbeer.com/wp-content/uploads/2015/11/zbc-website-header-logo-500.png Robert Hilferding2016-02-28 09:31:012019-01-07 12:29:06Bar starts to take shape. Fermentation vessels have reported for duty. Make your mark on the new Brewery!